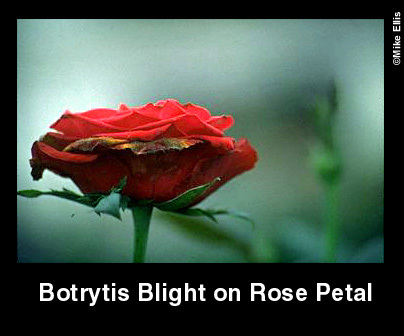 rotting buds and flowers, and spotted canes are all symptoms of Botrytis. Cause: Plant debris. Favored by high humidity and condensed moisture. dying tissue. It is frequently found on older flowers and other plant parts. Under certain conditions it may also attack healthy tissue. Prevention: Make sure you have good air circulation and balanced fertilizer. Suspend nitrogen fertilization and fertilize with potassium. Remove affected plant parts. Fungicide sprays can be used with seedling beds.